The wizards have created a magical cake for the ultimate birthday celebration. Gourmet dessert lovers will adore the amazing 5 colorful fruity flavored cake layers. The cake is then covered with a delicious creamy white frosting and topped with a colorful array of frosting dollops and a tasty Birthday plaque. Confetti sprinkles complement the rainbow of colors! Arrives in an elegant gift box. 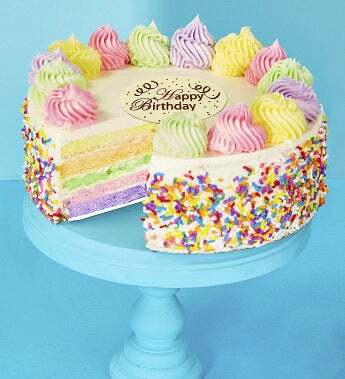 7” Rainbow Birthday Cake, net wt. 1.5 lbs.